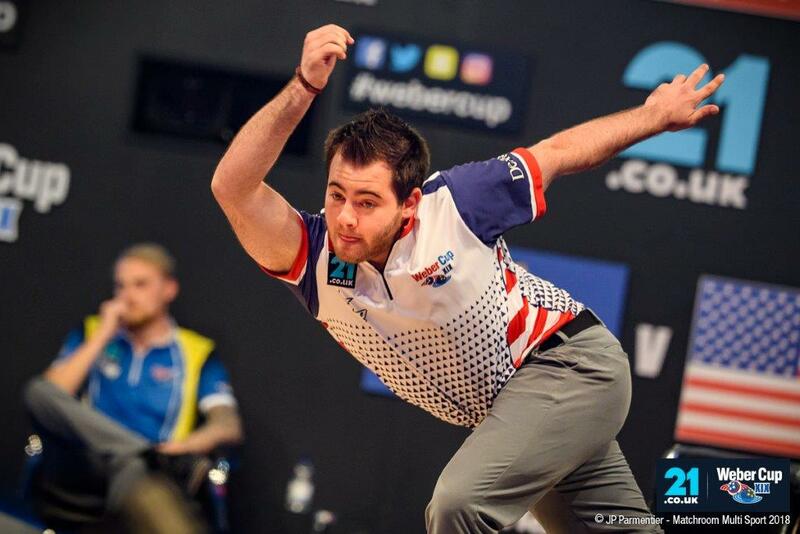 THERE WAS more joy for Team USA as they enjoyed another 5-2 session win to stretch their overall lead to eight points with just two sessions played at the 21.co.uk WEBER CUP. The Americans need just nine more points to win their first Weber since 2012 while Europe, on the other hand need 15 more wins to lift the trophy and on current form that looks to be a big ask. Europe needed a strong start after yesterday evening’s outcome but it went wrong quite quickly as Kyle Troup bested Stu Williams and then returned to the lane in the company of Anthony Simonsen to take another point. Simonsen then stayed out for a singles match as he beat Jesper Svensson by 20 pins. That put the USA 8-2 to the good with the Europeans desperately needing something to steady the ship. That came from Williams and Larsen who beat the Barnes and Jones axis by a single pin. Europe won the next as Barrett and Jones slugged it out to finish 267 apiece before the Euro skipper took the point in the second roll-off. With momentum on their side, Europe needed to capitalise but Troup and Jones put paid to that as they won the next match by a 35-pin margin. The 21-year-old Simonsen was back for the final match and he kept his winning streak going with a comfortable 56-pin win over Jesper Svensson to put his team in a dominating position. Commented USA captain Chris Barnes, “I have been impressed with Anthony for a long time – nobody in the world is hotter than he is right now. He has just won in Singapore, he wins often and he has proven in the last two days that nobody is bowling better than him right now. “We want to win every session and when you get a 3-0 start you think we can really put a big one in but Europe are who they are and there is a reason they have been champions the last five years. They came back and it looked like we might be lucky to survive a one-point loss this session but Kyle and TJ pulled a great game and Anthony put the finishing touches on – he has been dominant. Play continues at 18.00 with one Baker match and six singles matches.